What a difference now that the pacifier is gone! The pick up/put down technique really works. Last night Kien had his dreamfeed at 22:00, and he slept through until his need feed 4 hours later. He woke himself up at 5am because his arm came out of the swaddle, so I gave him his feed after I re-wrapped him. He went back to sleep until 6:30 (his arm came out again), so I tucked it back in and he slept for another 30 minutes. This morning he went down for his nap so well. I didn't even have to pick him up at all. I left him in his cot protesting (load moan without any tears, stops, starts again, and peters out after a few minutes). He is now fast asleep. Yesterday he actually transitioned himself into the next sleep cycle; for his last nap he did one and a half hours...he has only done that a few times since sleep training. I am so chuffed. I've also transitioned him to a 4 hour feed cycle. Staying on the 3 hour cycle did not make much sense since he wasn't hungry enough to do a full feed, and would really struggle and fight. So now he is having between 120 - 160 mls of milk at each feed - a huge improvement. 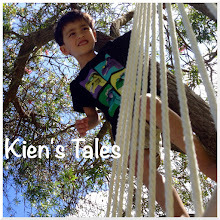 So all round Kien has blossomed, and my life his been transformed! WOOHOOO! That is wonderful Lien, I hope things continue to improve. He sure looks happy, what a gorgeous boy he is.